This is a scalable context timeline. 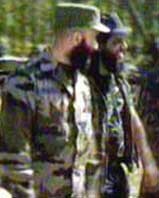 It contains events related to the event February 1995-1996: Islamist Militants Establish Foothold in Chechnya Conflict. You can narrow or broaden the context of this timeline by adjusting the zoom level. The lower the scale, the more relevant the items on average will be, while the higher the scale, the less relevant the items, on average, will be. By September 29, 1999, Russian ground forces begin invading Chechnya. Chechnya has been a de facto independent country since the end of the first Chechen war in 1996, but violence has been escalating. In early August, some Chechen fighters attacked the neighboring Russian region of Dagestan (see August 7-8, 1999). In late August, the Russian military began bombing parts of Chechnya (see August 25-September 22, 1999), and by late September that turned into a heavy aerial bombardment. [CNN, 9/29/1999] By October 5, Russia claims that its forces control about one-third of Chechnya. But this is only the flat terrain north of the capital of Grozny. [CNN, 10/5/1999] The battle for Grozny will take months and securing the mountainous terrain in the southern third of Chechnya will take years.